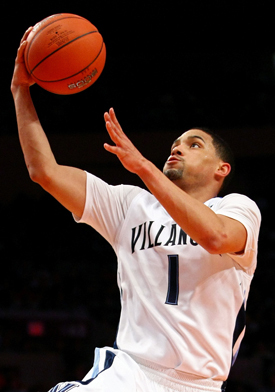 The “face of Villanova Basketball” will soon become a familiar one around the NBA. After spending four years developing under Jay Wright at Villanova, guard Scottie Reynolds is eager and, more importantly, equipped to emerge as a backcourt talent in the league. Reynolds put together one of the most prolific careers in Villanova and Big East history and was named a 2010 first team AP All-American, joining the ranks of Randy Foye (2006), Kerry Kittles (1996) and Paul Arizin (1950) – the only Wildcats to earn that distinction. Reynolds led Nova to the Final Four during his junior year, their first appearance since winning the 1985 National Championship. Holding a sizable deck, he flirted with the NBA and entered his name into the 2009 draft, but ultimately decided to return for a shot at a national title. Though that dream fell short, Reynolds had an extremely successful campaign, coming just 21 points shy of Kerry Kittles’ all-time scoring record and becoming immortal in the eyes of Wildcat fans. Though somewhat smaller than the prototypical pro, Reynolds boasts a strong, compact frame capable of exploding to the hoop. And while he has great ability to fill it up on offense, I believe his defensive instincts will keep him around the league for a long time. Likely a late first round pick, Scottie Reynolds will have a chance to help a playoff team return to postseason competition and perhaps propel them further. Look for Reynolds to follow in the footsteps of the impressive rookie guards from last year’s pool and to make his own splash in the NBA soon. As a ‘Nova grad, I hope you’re correct. However, I have the sinking suspicion that he may have played himself out of the draft with that clunker of a Tournament he threw up. It doesn’t necessarily pain me to be cynical, but no one has ever been all that high on Reynolds draft stock. However, maybe you’re the new wave, Mike “The Czar” Fratello. God knows how well it worked out for the last Czar/Nick combo. Nick, I agree with a lot of what you said, but I also think Scottie’s NCAA performance may have been affected by something else in light of his being benched, along with Corey Fisher, for the start of the first-round game against Robert Morris. Hopefully he will return to form for his freshman debut in the NBA. I think hes a superb scorer that any team would be fortunate to have. Im thinking late 2nd round due to his height.